Despite some allergies, our family loves the outdoors and beautiful gardens. 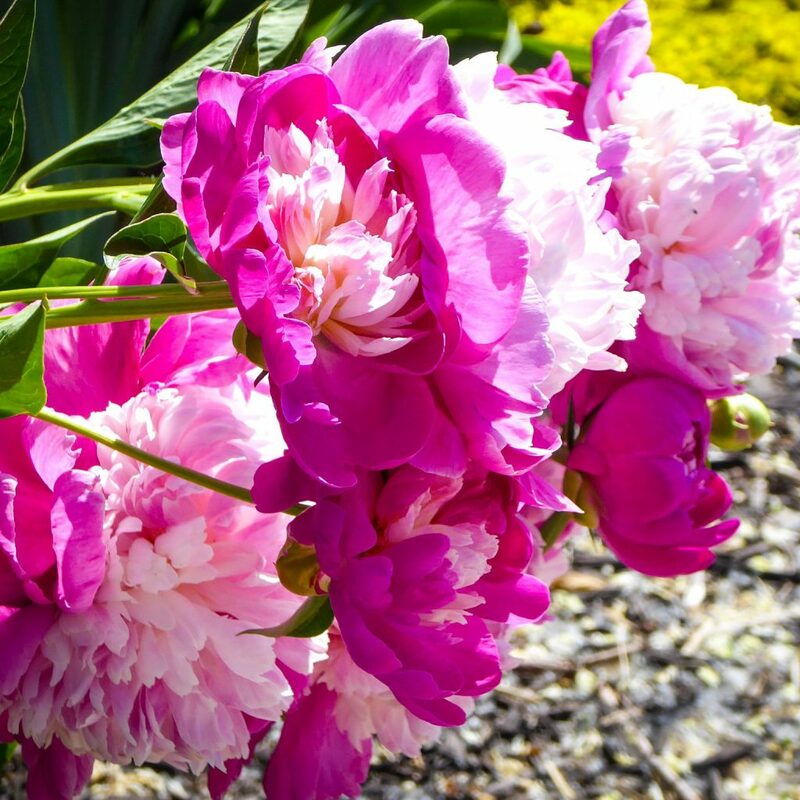 We would love nothing more than to have our own special flower gardens. There has been some success, but we must admit that we don’t have the greenest of thumbs. 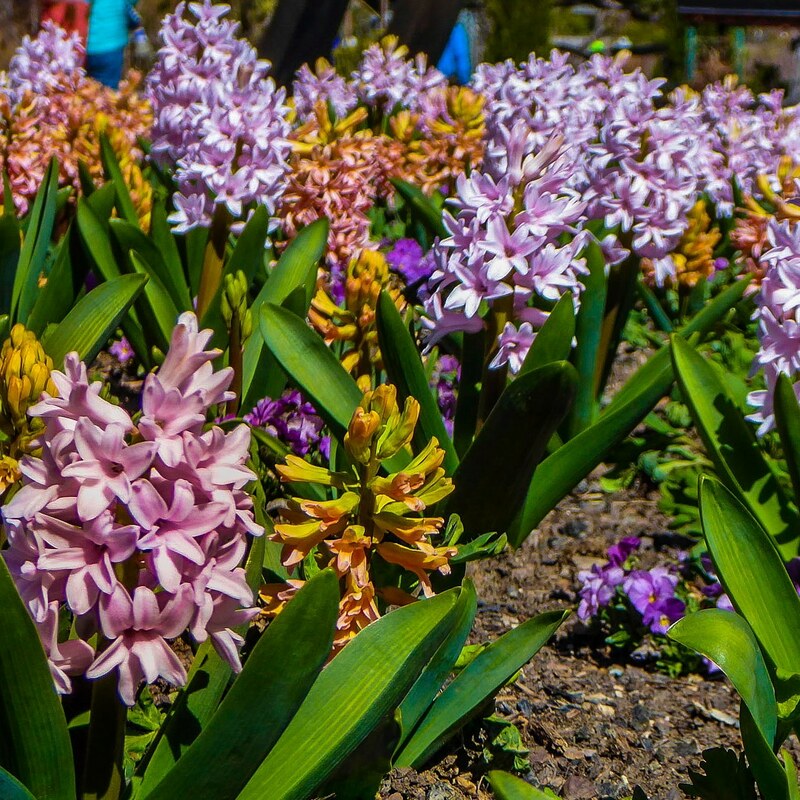 We do, however, enjoy visiting botanic gardens, and the Denver Botanic Gardens, with multiple locations, help us smell the roses, and lilies, and daffodils, and even the stinky corpse flower. The cornerstone site for Denver Botanic Gardens is the downtown York Street location. 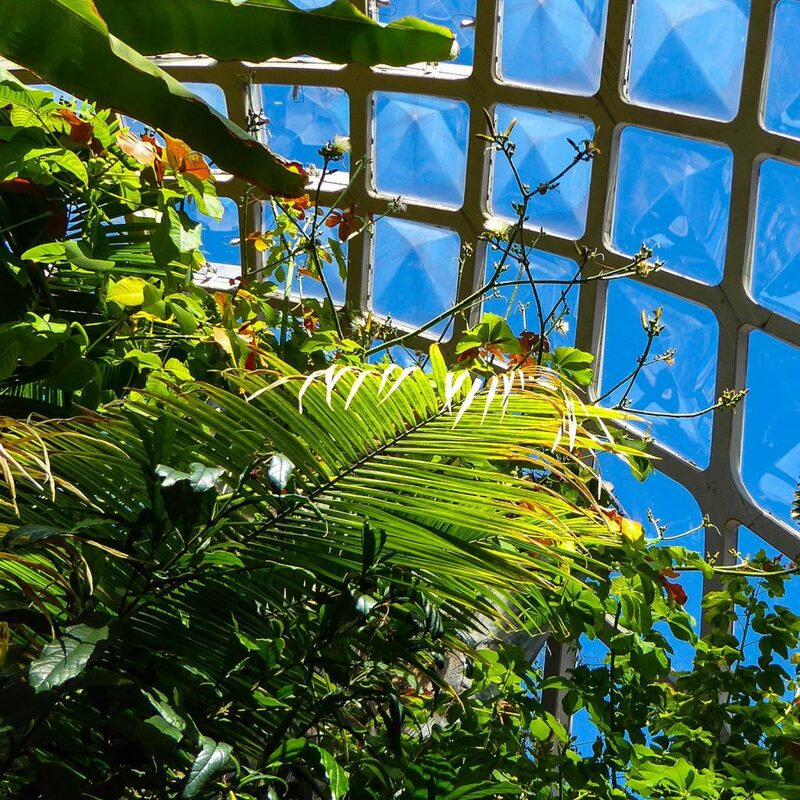 The 24-acre gardens has everything from native plants to tropical specimens found in the Boettcher Memorial Tropical Conservatory. In the conservatory you find the Corpse Flower, affectionately called Little Stinker. 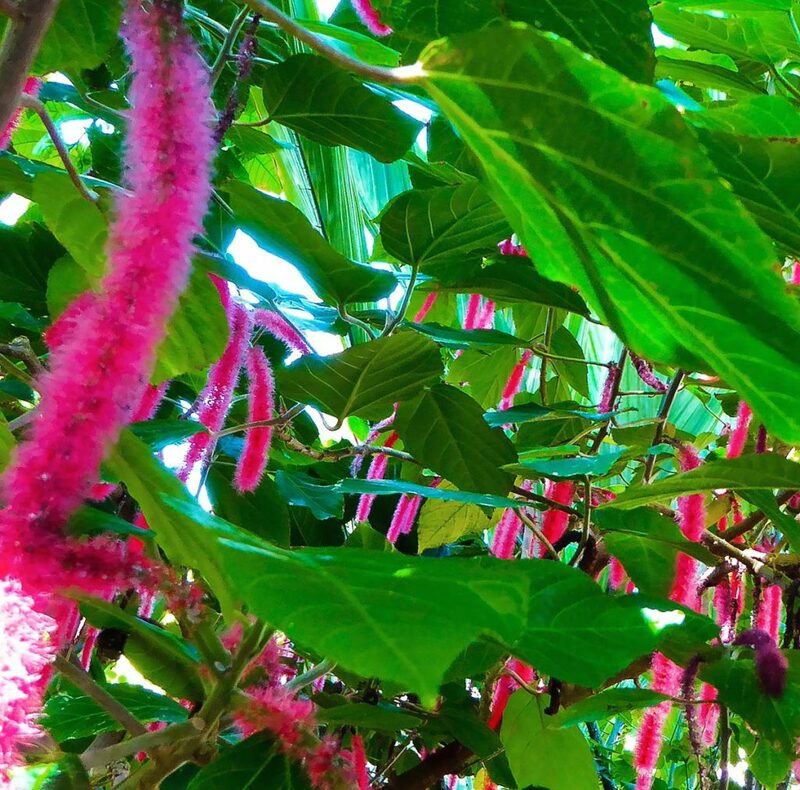 The flower, which measures 5 feet, blooms for one to two days, emitting a terrible smell that attracts the carrion beetle, the primary pollinator. Little Stinker bloomed in August 2018, and blooms occur once every 7-10 years. The Corpse Flower is quiet a draw for the Denver Botanic Gardens. Insider Tip: All three locations have Free Admission Days. Check the calendar for those free days. York Street has a Japanese Tea Garden, Bonsai Garden, English Rose Garden and a rock alpine garden, and a steppe garden. We enjoy strolling through each garden, admiring the flora and the landscaping of each garden. It makes us wish we had more time and resources (and a larger back yard) to create such captivating landscapes. The Science Pyramid is an interactive digital gallery where you learn about ecology and plants in Colorado and around the world. We like to spend some time here during each visit to learn about sustainable living. Next to the pyramid is a large play area with a steep grassy embankment. The kids love rolling down the hills, etching green grass stains on their clothing. Whenever we have visited, there has been someone with a bottle of bubbles. Every kid — and some adults — get a kick out of chasing and popping the bubbles. We love all of the animals we get to see roaming the gardens. 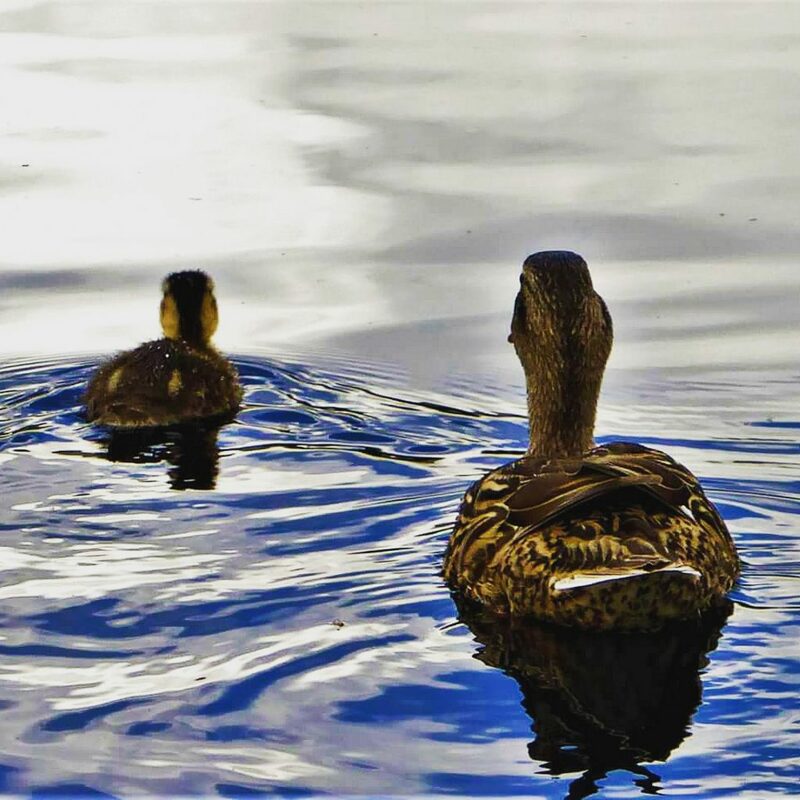 Of course we see butterflies and bees, but we have seen rabbits and ducks, too. We had the privilege to see ducklings learning life skills from their mother during one visit. Chatfield Farms is located in Littleton, near Chatfield State Park. 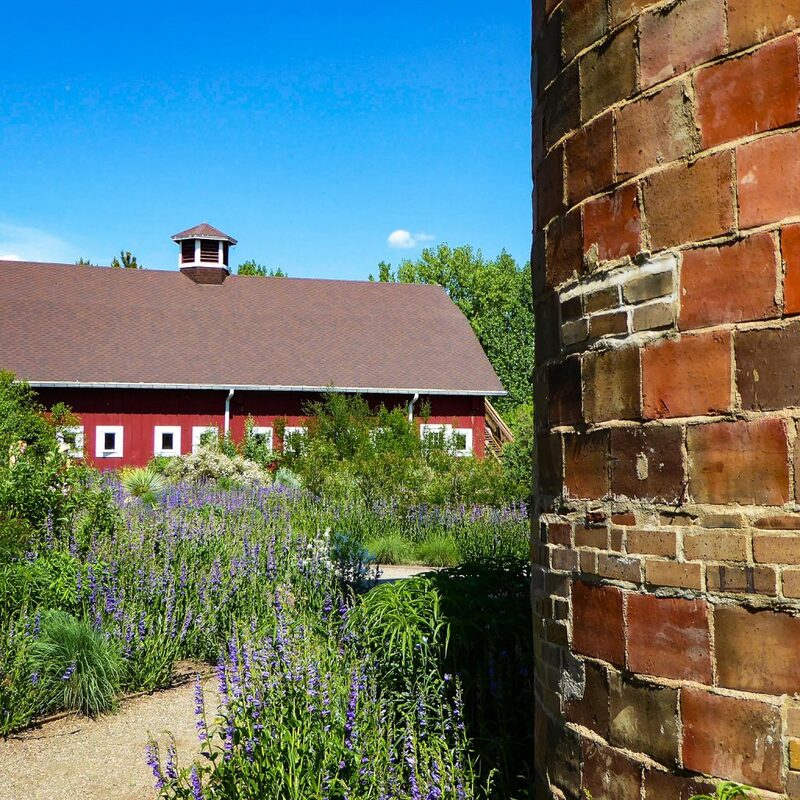 The 700-acre grounds have a working farm, lavender garden, native specimens garden, and the Hildebrand Ranch. 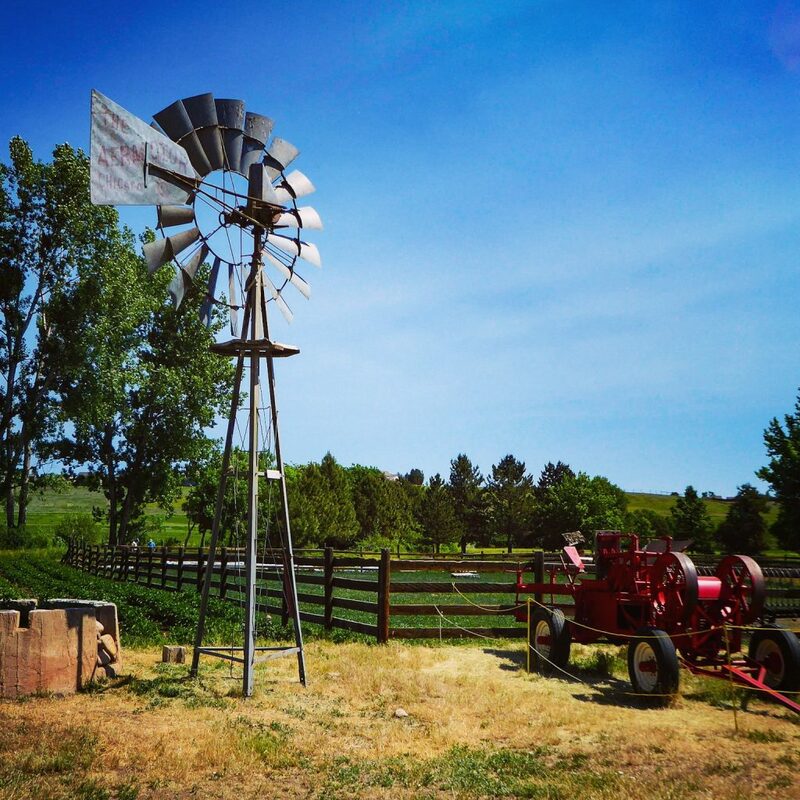 Chatfield Farms features an annual pumpkin patch, haunted corn maze, lavender festival, and an indoor tour of the Butterflies of Chatfield. 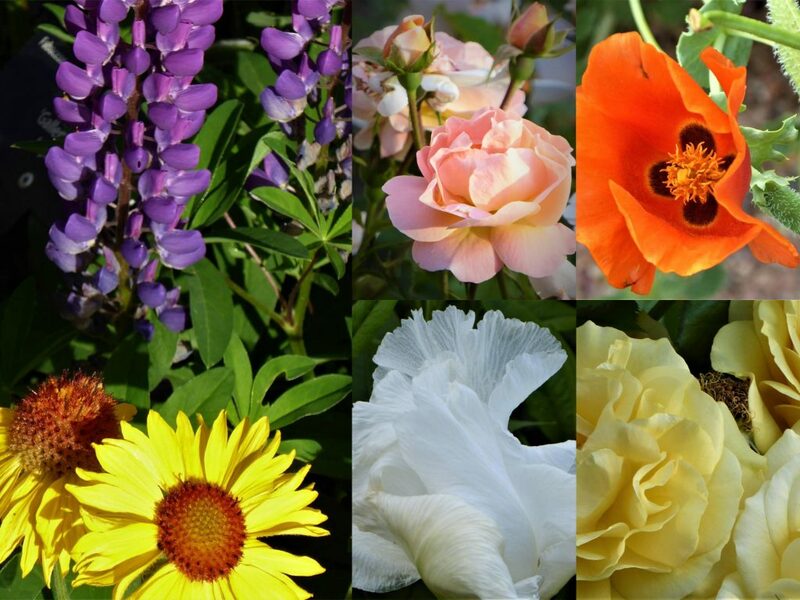 You can visit any season of the year and see different blooms and harvests. 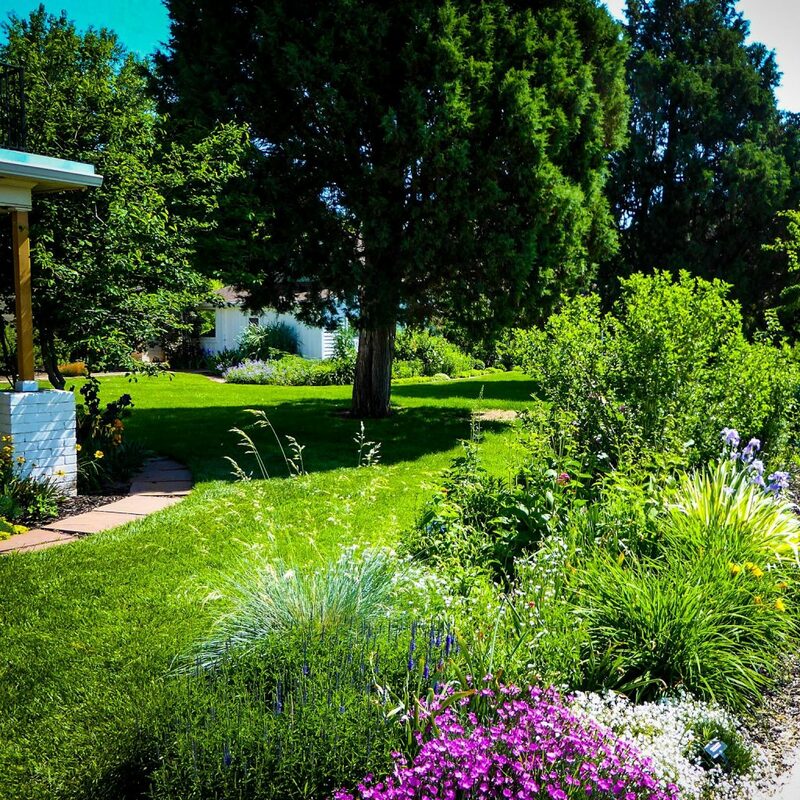 While the York Street locations has more structured gardens, the gardens at Chatfield are more natural and free-flowing. The Farm is special because you are able to walk among the barns, silos, a farmhouse, and a schoolhouse while admiring the flora and fauna. A gently flowing creek runs through the premises. You can picnic at a lake, or near the Wedding Chapel. Volunteers are always at work planting and harvesting the farms’ goods. Walking though the site feels like taking a step back in time to the late 1800s and early 1900s. A enjoyable stop at Chatfield is at the Hildebrand Ranch, which is on the National Register of Historic Places. You can see the farm equipment used on the ranch. You can see the cutting flower garden and herb garden near the ranch house. In the barns, you can catch a glimpse of (and maybe pet) a pony or a goat. We really enjoy touring the ranch house, which is still set up to represent life in the early 1900s. Inside the ranch house, docents describe life in the early 1900s. The home is set up with artifacts from that era, including fireplace and stove, kitchen cookware, dining room plates and silverware, and a sewing room with an authentic Singer sewing machine. It’s fun to see the magazines from the period and the family pictures hanging from the wall, illustrating a simpler era before the digital age. There was a lot of hard work involved in maintaining a ranch, but it seems more idyllic and rewarding than our hurried pace today. We are fans of the Little House on the Prairie book series by Laura Ingalls Wilder. The author tells the stories of her childhood, growing up in the plains of Kansas and South Dakota. When we toured the Plains Conservation Center in Aurora, Colorado, we remembered the books and the adventures of the Ingalls Family. The 1,100 acre Plains Conservation Center is located on the eastern edge of Denver metro area. The Center aims to teach an appreciation of the prairie ecosystem through various education programs. Unlike the other two sites, Plains has no real structured gardens. 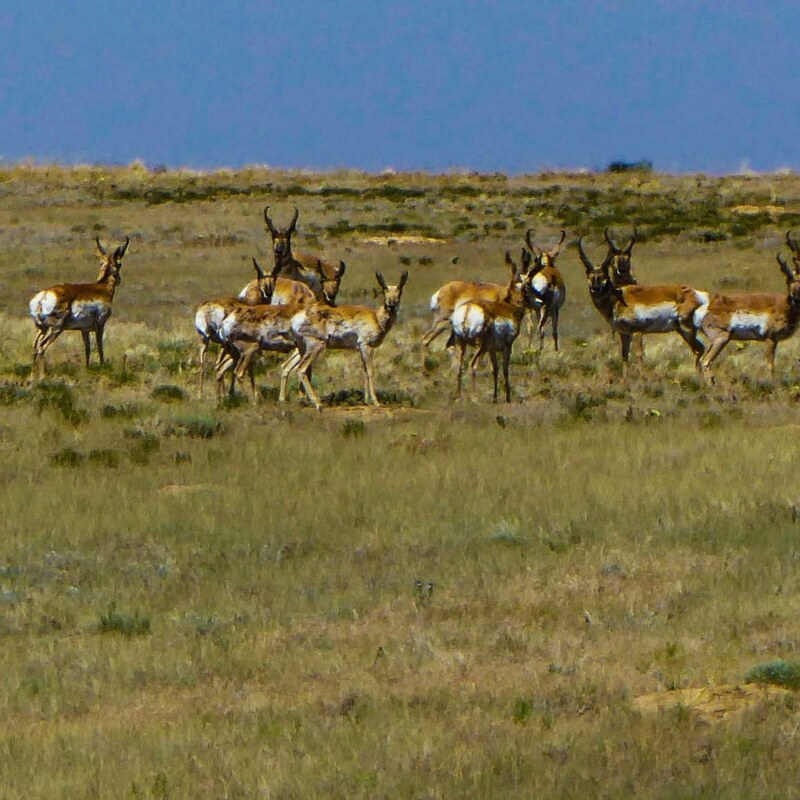 The grassy fields grow naturally, although domesticated sheep and donkeys, and other wildlife like pronghorn help tend the grasses. The highlight of Center is a wagon ride through the grasslands where you can spot prairie dogs. pronghorn, red-tailed hawk, coyotes, and bald eagles. When we toured, the bald eagles were nesting, so that area was closed off to foot and vehicle traffic. Still, we could see the nests from a distance. The wagon ride takes about 40-minutes. We saw a lot of wildlife, although the wagons were always moving, making picture taking extremely difficult. We learned fun facts during our ride. For example, we discovered that the pronghorn (North America’s fastest land animal) is so speedy because a North American Cheetah used to prey on the beast. We also learned that the red-tail hawk screech is used as the “voice” of a bald eagle in television and movies since the eagle’s call sounds more like a turkey. These are important factoids for a 10-year-old boy. 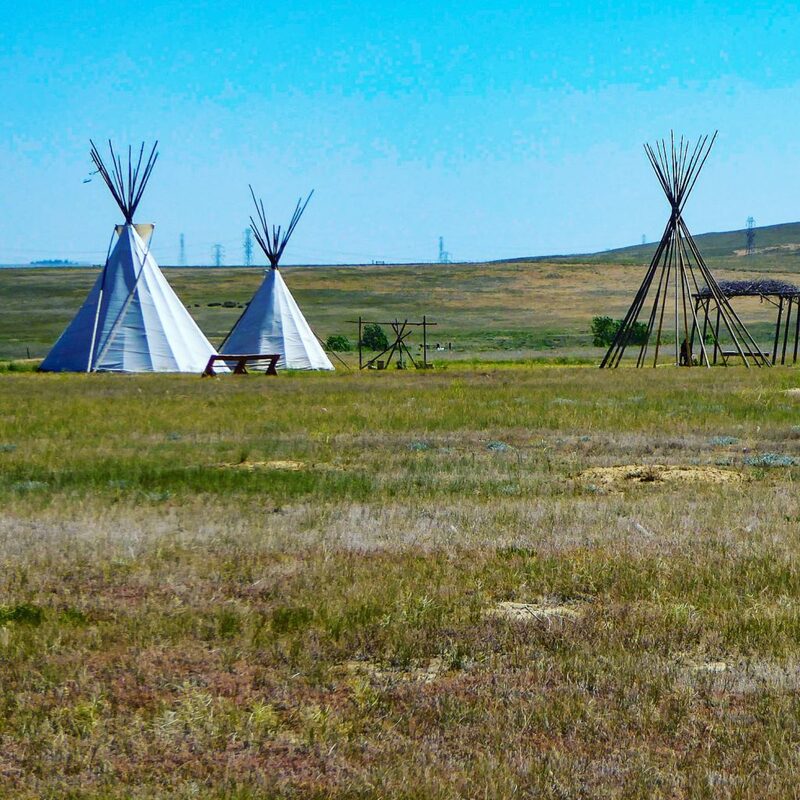 The Plains Conservation Center also has a set of tepees and area where you learn about the Native American plains tribes that called Colorado home. Since the Denver Botanic Gardens has a number of locations and sites, you are able to learn about a great number of ecosystems with visits. In addition to the three sites in this article, there also is the Mount Goliath location in the Rocky Mountains highlighting alpine plants and centuries-old bristlecone pines; and the 16th Street Mall Garden Block, an urban public space garden in the center of Denver’s premier shopping district. 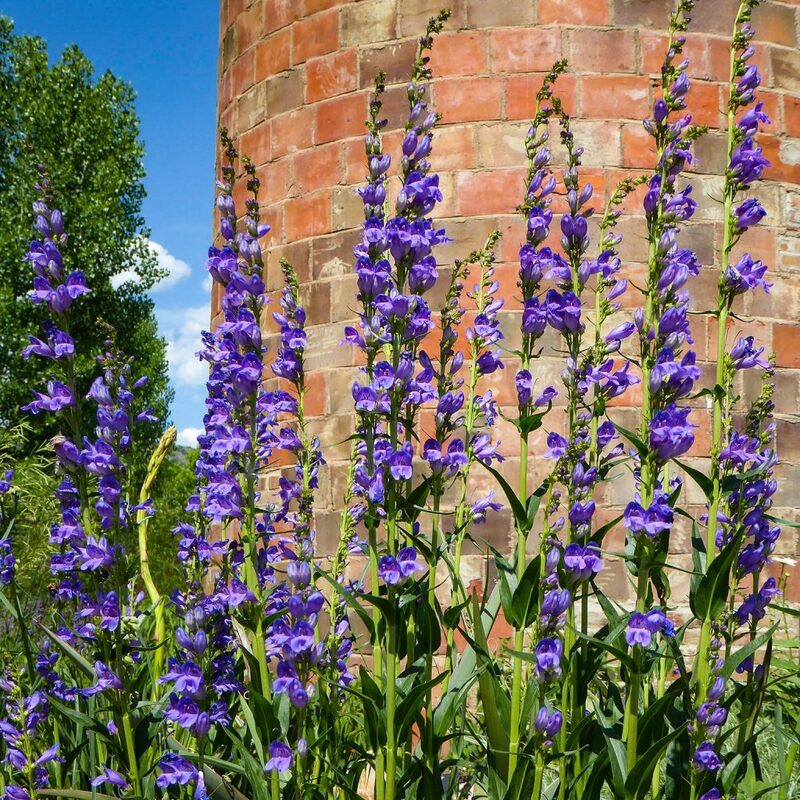 With so many sites and so many specimens, the Denver Botanic Gardens should have something that every family can appreciate. Do you like to walk through botanic gardens? What is your favorite garden? Please leave a comment. We’d love to hear your thoughts. We are often in Denver. 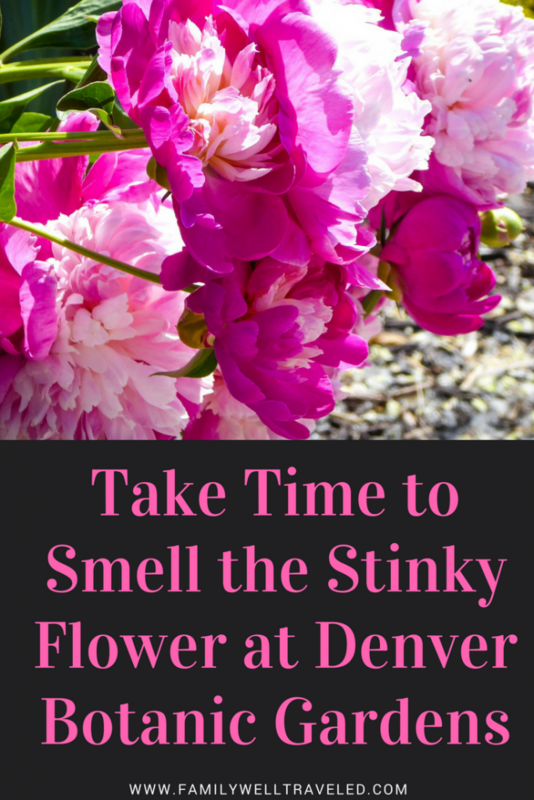 I didn’t know that Denver Botanic Garden has 5 sights and has that stinky flower! You will have to check out one of their locations the next time you are in the area. Thank you. 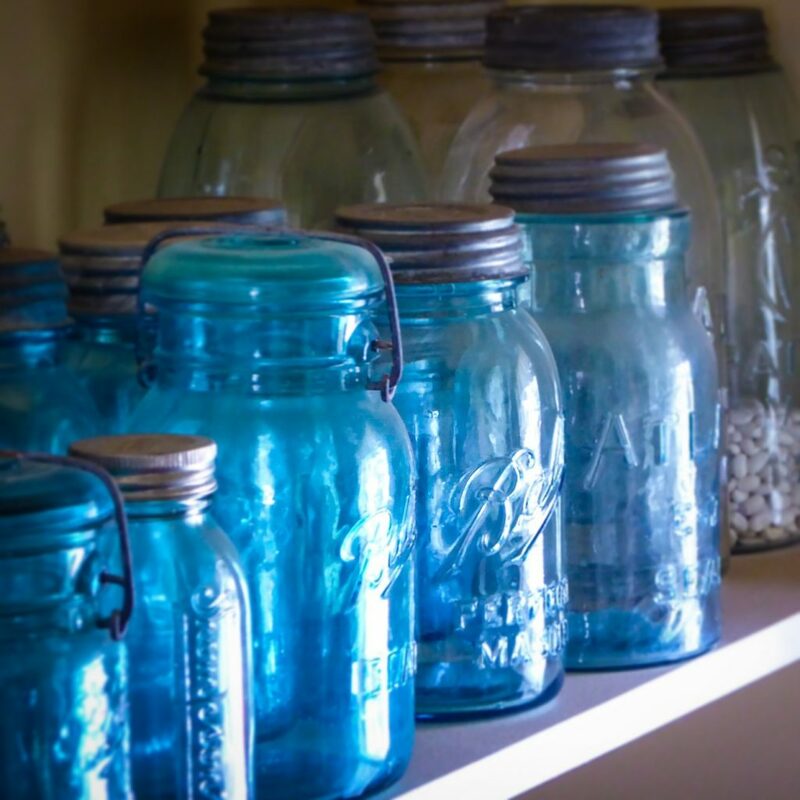 I really like the mason jars, too. I love to explore botanical gardens as well. I can’t believe I missed this opportunity when I was in Denver. I fight the allergies as well, but I just pop an allergy pill and hope for the best! I recently found out that the United States features stand-alone rose gardens across the country as well. Our list keeps growing too. Happy travels. I have to admit I never thought of visiting Botanic Gardens. But after seeing you r pictures I can definitely see the appeal. Thanks for sharing. So interesting that there are man different Garden spots to visit too. I always just imagines the Botanical gardens as just being in one place. Shows what I know! Great Share. Thanks again! We like how each site has its own vibe. That is really appealing to us. Next time I am in Denver, I need to visit this area. I especially would love to tour the ranch house. I love walking through historic homes and viewing all the artifacts from that area. It really helps me envision what life was like during that time. The ranch house really made you feel like you were taking a step back in time. I love the way that is park has incorporated native American history into a botanical garden. The stinky flower sounds like a fun experience haha, one day I will head here when I am near Denver. Great post! I appreciated how the Gardens incorporated different cultural experiences into the sites. 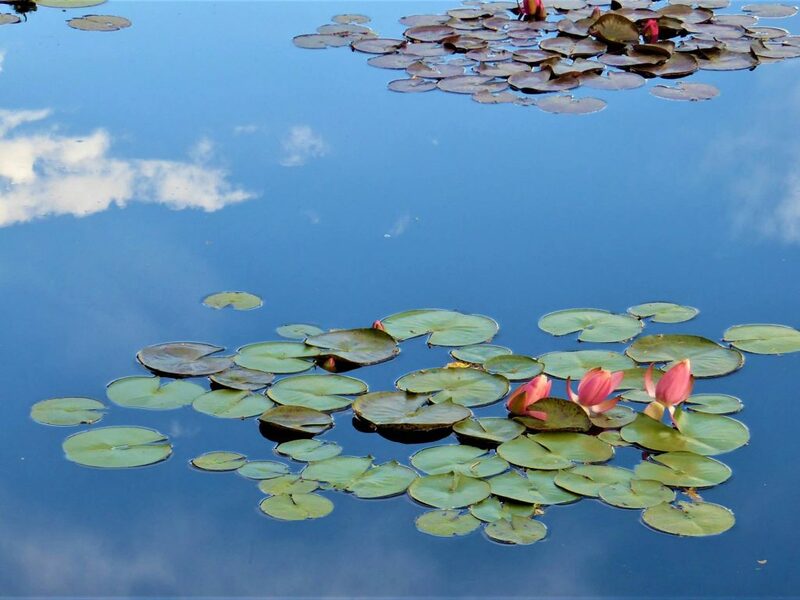 I love the title of this article 🤣 Colorado is so beautiful and I can only imagine how many gorgeous sights are available at the Botanic Gardens! 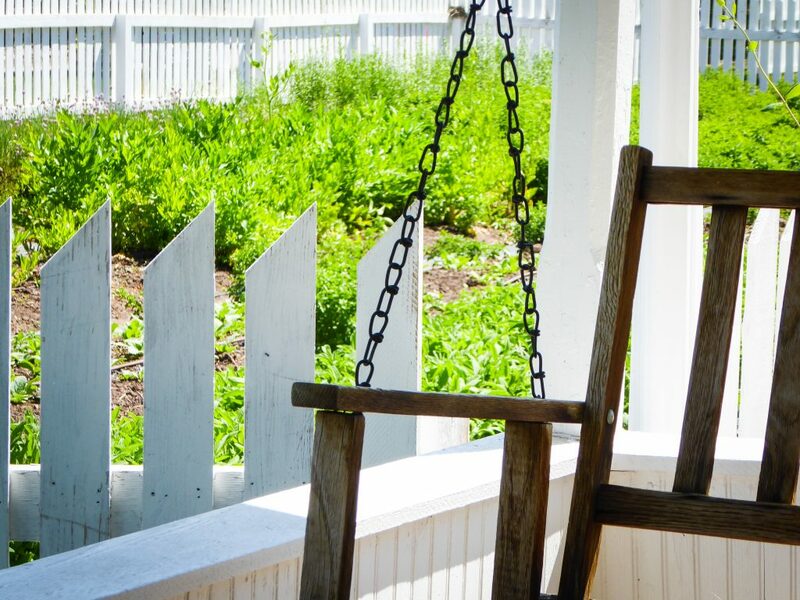 That porch swing looks like an absolutely perfect spot to relax, take a deep breath and take it all in 🙂 Great tips here, thanks! Thank you. The ranch house and porch swing would make ideal locations for taking it all in. We, too, hold down full-time office jobs, so we enjoy the opportunity to get out into nature every once in awhile. Haha, the Little Stinker! And wow, it only blooms ONCE every 7-10 years?! I would love to take my kids to the Plains Conservation Center… everyone loves wagon rides! The lines to see Little Stinker when it blooms are pretty long, but not unexpected since it blooms so rarely.